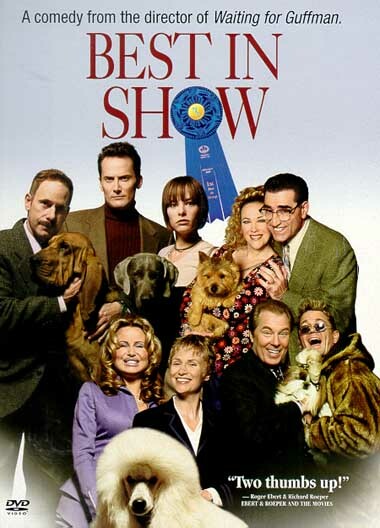 Christopher Guest, writer/director of This is Spinal Tap and Waiting for Guffman, continued his documentary-like comedic style with Best in Show. The story follows a handful of colorful and eccentric dog owners that compete in a national dog show. Like This is Spinal Tap and Waiting for Guffman, Best in Show uses “interviews” and documentary-like camera techniques to produce a fake documentary, or mockumentary. The interviews are set to look and feel like an interview that would happen in an actual documentary; i.e. even lighting with a softly focused or non-distracting background, the camera still on a tripod, etc. Having a blurred line between the mediums of non-fiction and narrative is becoming one of the funniest styles of film and television. Christopher Guest was one of the pioneers with This is Spinal Tap and he delivered beautifully with Best in Show. In and of itself, a dog show is not very intriguing. But when you have a group of actors playing the caricatures of the people that spend their lives participating in these events, the content matter is elevated to hilarious stature. One of the most interesting things about Guest’s approach to this type of filmmaking is his allowance of improv for his actors. Essentially, he tells the actors where the scene needs to go and gives them almost complete creative control and trusts them to get there. Some of the funniest bits in this film were tangents that the actors go on when they are being “interviewed.” In most cases those tangents weren’t written, but were made up by the actors who have devoted themselves to their character. This aids to the realistic feeling of the film and makes the situations, however ridiculous, totally believable. And though it is one of the least polished (looks wise) films out of my 5 reviews, its content was one of the most entertaining and enjoyable to watch.